I understand that this pattern may not be perfect so make sure you check out some of the comments from fellow knitters who have found mistakes with this pattern. Meanwhile, I am going to rework my patterns to make sure they are perfect. I will update them soon. I just laid around and knitted all day. I made an apple to go with the pear that I made yesterday. I like making fruit people. I don't think that I will put arms and legs on them. Her name is Mrs. Saucy Apple. I also have a pattern for all who want it. k2tog around - you should have 6 sts. cut a long tail and pull through remaining sts. with your needle and put the needle into the center and through to the underside through the center. make sure that you pull tight so that it has a dimpled top like an apple. make a good knot. make a leaf just like in the Mr. Pear pattern and an i-cord stem-sew them into the dimple and embroider and paint on her cute little face. awesome apple! I love the expression on its face. I must scrounge some red yarn for this one. 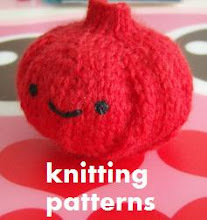 I made an apple today using your pattern! I have a picture on my blog. I came to your blog for your apple pattern (I'm making it as a wedding gift my friend is doing her kitchen in apples so I'm giving this to her as a ring holder by the sink and make the stem to safely tie her rings on)And I see The Beatles! My daughter is named after a Beatles song... Prudence. Not to mention I'm often tested for Chrone's. I feel like I hit a lucky find! DutchMoeder, thank you! my best friend has Crohns. that's really hard to deal with just like Celiac, good luck with it! thanks for reading my blog! Hey Alex. You might want to change the pattern slightly, to read (for example): *k1, kfb rep * around - 18. I didn't realize it was a repeat unti I was on row 8 :-). Your fruit people are so cute! hey, so this my be a silly question, but i've never used double pointed needles before, so how does this work? do you ever purl? i'm a little confused haha! thanks for the help! finally got around to making this recently. turned out really cute, of course (because your fruity patterns are awesome). I'm a bit of a math geek, so I took the time to work backwards through the decreases to see what's up with that last increase row, and I think I've got it: it should read "kfb 8 times - spread them out - 44"
because if you have 44 stitches when you stop increasing, all your decrease rows make sense. I hope that's the solution. I don't understand the pattern. Is it supposed to be knitted on 4 dpns? I'm asking because I wonder how you divided 6 sts on them :/ Help? I use 3 dpns always with a fourth working needle. I hope that helps. Hi. I like your knitted fruits very much. Apple is gorgeose. But I also have problem with the pattern. I can't understand how you increase. I'm a city explorer, crafty person, student of art, bookworm, mommy of rescued animals, lover of images and blogs. My blog is a combination of all the things I love and a little about the things I do. Thanks for stopping by my little corner.